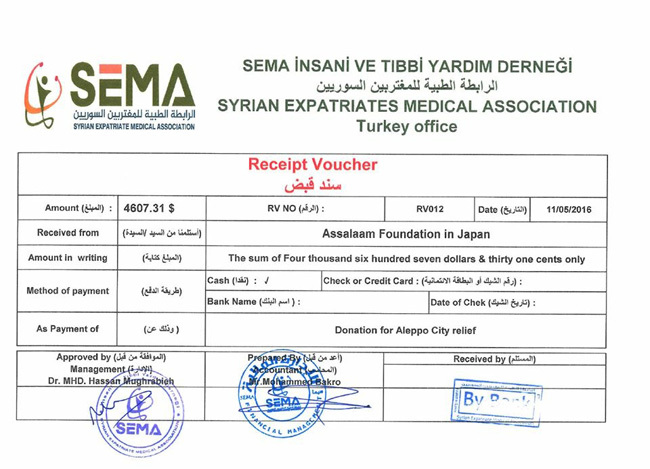 We have successfully sent Syria the donation money from the past weeks, the total amount of USD 4607.31, alhamdulillah. The donated money was given to the Syrian person who lives in Tokyo then later transferred to Syria. The sole purpose of this donation is food and medicine. We would like to express our gratitude for those who contributed to this fund. However, this is not the end of the story. As far as there are people out there who are going through hardships, we would like to continue our support, insha'allah.